TV networks are running out of excuses for the dwindling popularity of the National Football League. They blamed the election for ratings declines last year, and hurricanes for a soft week one in September. Protests during the national anthem, and President Donald Trump’s criticism of the league, have faded from the headlines. Advertisers are starting to believe a different explanation: the viewers aren’t coming back. Audiences are down an average 7 percent from a year ago through the first eight weeks of the season, excluding last Monday. That’s on top of a decrease of about 8 percent last season that spurred numerous changes in the broadcasts, from shorter commercials to better matchups earlier in the year. With CBS Corp., 21st Century Fox Inc. and Walt Disney Co. set to report earnings in the next few days, analysts are bound to raise questions. These companies have used the popularity of the games to extract additional fees from cable operators, promote other shows on their networks and sell lots of commercials. Pro football games drew about $3.5 billion in ad spending last year, including the postseason, according to SMI Media Inc.
Media companies have spent billions of dollars on the right to air football games, which had been immune to the erosion of viewership for other TV programming. Audiences for TV networks have diminished for years as the growing popularity of online alternatives Netflix and YouTube and the availability of most shows on-demand have reduced the appeal of dramas and comedies. Live TV, like sports, was supposed to be immune, but that theory looks highly questionable now. Ratings for the NFL suggest the same societal trends are now affecting the league, even if the declines aren’t as dramatic. The drop in game viewership ranges from 5 percent for NBC’s “Sunday Night Football” to 11 percent for the CBS Sunday package. “Monday Night Football,” on Disney’s ESPN, has attracted more fans this year than a year ago, but the numbers are still down from 2015. Viewership of the four main broadcast networks fell 8.7 percent last year, and 12 percent among adults 18 to 49, an important demographic for advertisers. 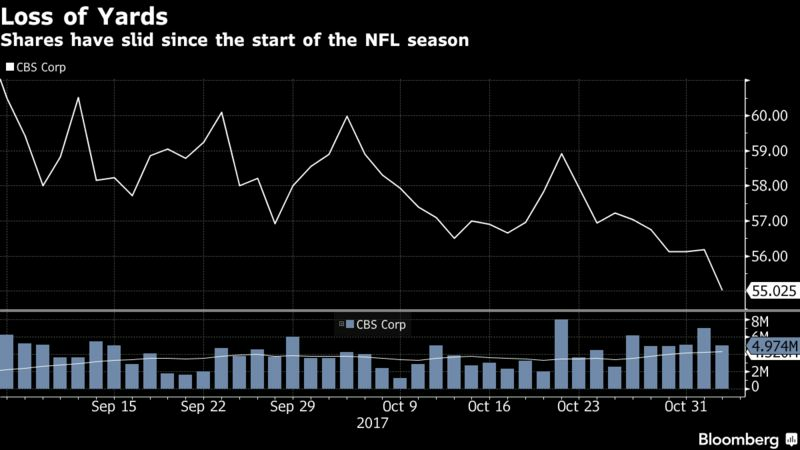 CBS’s 11 percent slump for NFL games is the steepest of the networks. Its parent company, which reports earnings after the close Thursday, is more vulnerable than rivals to the trend because the vast majority of its earnings come from the broadcast network. The declines at CBS reinforce a complaint that has gotten louder and louder in recent weeks: The league got greedy in adding the Thursday night game on broadcast. Reserving top games for Thursday night robbed other time periods of good match-ups. After a nosedive in ratings at “Monday Night Football” last season, the league has scheduled better games for that time period, further damaging Sunday afternoon. “Ratings declines on both general entertainment and NFL programming could be the single biggest point of focus for investors this quarter, and we’re not sure what media companies can say about the health and tone of the ad market to assuage fears,” Steven Cahall, an analyst with RBC Capital Markets, wrote in a note last month. Viewership is dropping fast among people under 54 — a key demographic for advertisers — and even faster among those 18 to 34. Audiences for games on CBS, NBC and Fox have slid at least 10 percent among that younger cohort. Advertisers aren’t abandoning the NFL, one of the only places they can still reach more than 10 million people at once. But they are growing concerned. John Schnatter, who appears in TV spots on behalf of his Papa John’s Pizza International Inc., laid into the league on a conference call this week, blaming the ratings for his company’s slow revenue growth and calling for the league to put an end to player protests. Networks and other advertisers identify a wide range of reasons for the NFL’s struggles. The league has overexposed itself by making highlights available on Facebook, YouTube, Twitter and Snapchat. Identifiable stars like Peyton Manning and Aaron Rodgers have either retired or gotten hurt. The quality of play has deteriorated. Player protests and concussions have driven away some fans. Some executives argue viewership of the league has still improved over the long term while dropping for every other show. Yet the amount of time people have spent watching football this season is at the lowest point since 2011, back when there were fewer televised games, according to Mike Mulvihill, Fox Sports’ head of research.